Roger and Elaine Lynch took us on a fascinating walk around a small area of Fixby to see the remains of mines and quarries. Roger has gleaned his knowledge of local mining from mine abandonment plans, so has a good knowledge of the extent of underground workings in Huddersfield. The local sandstones are the Elland Flags and Greenmoor Rock which we saw at the disused Longwood House Quarry, one of many in the area. There was a mine entrance at the base of the quarry which was used to extract flagstones and roofing slates from gently dipping well-bedded sandstones. The Better Bed Coal was worked widely in the area and there are many shafts and adits, most of which have been filled in and the land used for housing. Roger pointed out several gardens and roads which have shafts and adits underneath them. 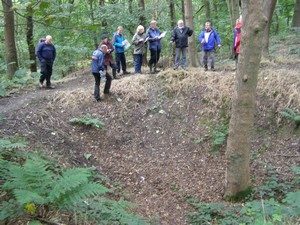 We enjoyed observing signs of mining in Upper and Lower Fell Greave Woods, such as bell-pits with trees leaning inwards around them because of subsidence. There were plenty of fragments of coal, iron nodules and some plant fossils lying in the spoil in the woods.